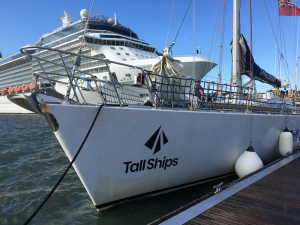 Tall Ship Challenger 7 graces the Southampton Boat Show 2018. The Tall Ships sail training vessel, Challenger 7, graced this year’s Southampton Boat Show with her presence, reminding me of Maldwin Drummond OBE, who is unfortunately not with us any more. 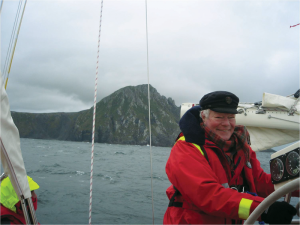 Maldwin passing Cape Horn on his round-the-world sailing trip. Maldwin was a keen and experienced sailor and a lifelong supporter of Sail Training, instrumental in building the STA schooners and Britain’s gift to Australia, STS Young Endeavour. 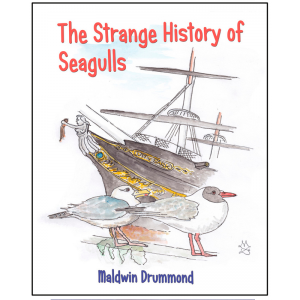 Little Knoll Press published Maldwin’s delightful children’s book, The Strange History of Seagulls, in November 2016. The book tells the history of the Waterside and Solent area – or rather George the seagull and his relations tell the story! This beautiful, quirky book is fully illustrated by Maldwin. It starts with the Vikings arriving at Ashlett creek and traces the Waterside coastline’s story right through to the development of foil sailing on today’s racing boats. Posted in Books, Children's Books, Countryside & New Forest, History & Travel and tagged Aslett, book, Challenger 7, children's, illustrated, Maldwin Drummond, Sail Training, sailing, Solent, Southampton Boat Show, Tall ships, The Strange History of Seagulls, Vikings, Waterside.